i think there's a wooden dummies name wrote "hayate" itself at page 2 .-. Wow! You're right! It's right there on page 2 in one panel by itself. He's hitting himself! HAHA! I'd definitely love to see another anime of Hayate -- and this time, it can stay true to the manga since it's going to end by next month anyway. No need for filler episodes. 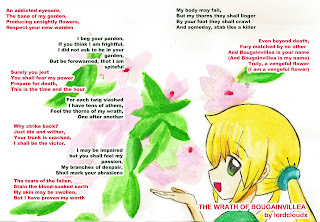 1: Isn't saku looks a bit different or it is only me? 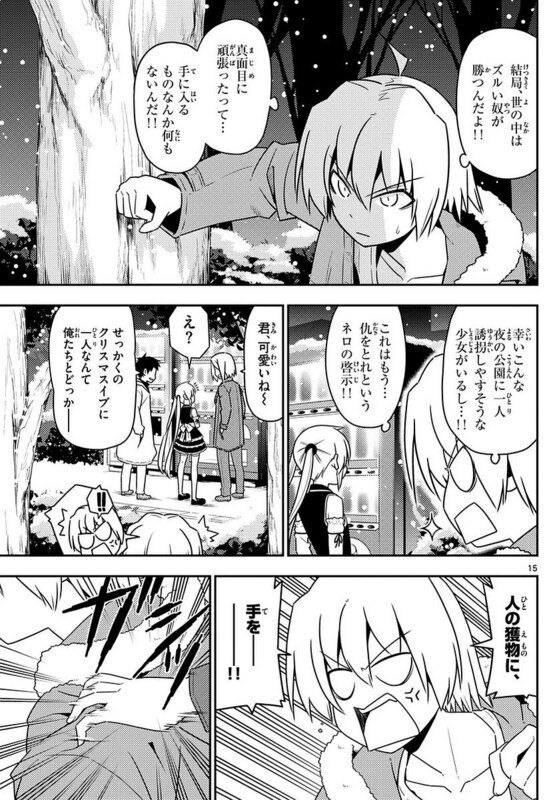 2: Did hayate destroy the mansion or it was destroyed being symbol of the family of the trio! 3: Why is kurosu here again , to inform chiharu about the incident of the hospital? Was she even there that time! Even if she was , she should have tried to make nagi come down herself. Is she too testing their bonding? 4: So himegami was really nearby that day. 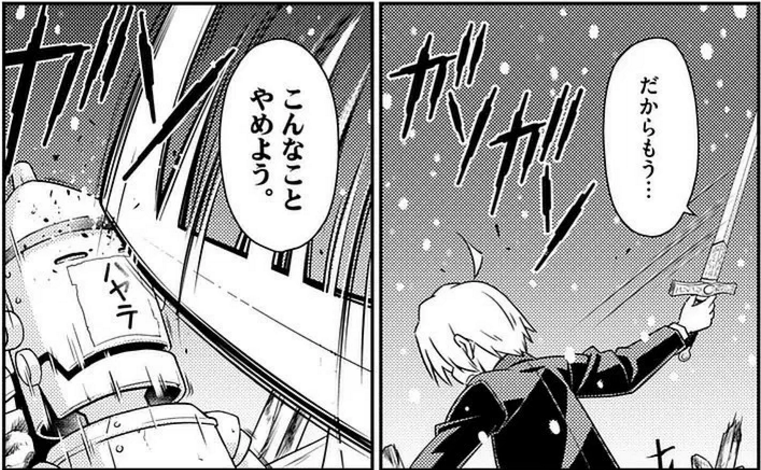 So why did not he save nagi quickly. Looks like he was waiting for hayate for some reason. And, I don't mind if the next anime season does not follow the manga too ( if any). 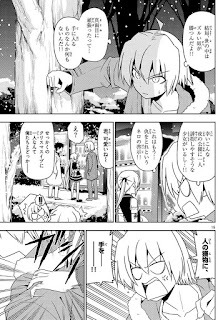 It would be good if it concentrates some issues after the timeline of the ending of the manga. 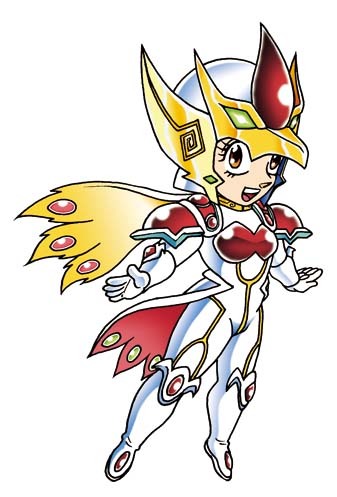 It can deal with the ships like atan-ikusa, ayumu-souya, hina- himegami, and nagi's struggle during her progression with the manga. The future rivalry of Nagi- ruka or nagi's wedding ( not only dreaming like the ova) will be sweet too. 1. Hmm... she looks fine to me. 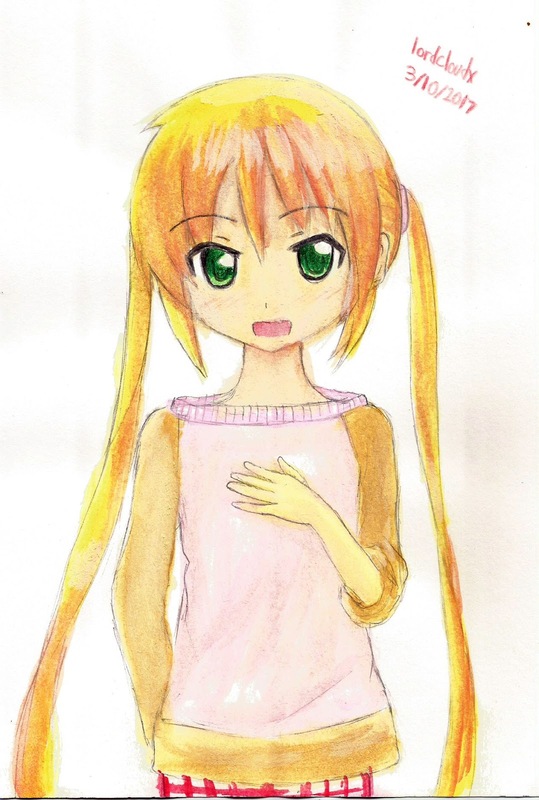 Hata's art style keeps changing all the time anyway. 2. I think those ruins symbolize Nagi "losing everything" because of Hayate. 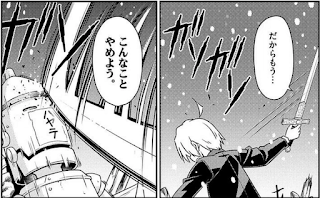 Himegami did tell him that much and I guess those words really haunted him -- especially after he broke Nagi's heart. 3. No idea about Kurosu. She's just sort of there. 4. Yeah, it does seem that way. Then again, it seems that in reality, Himegami had already left for quite some time before Hayate came into the picture. 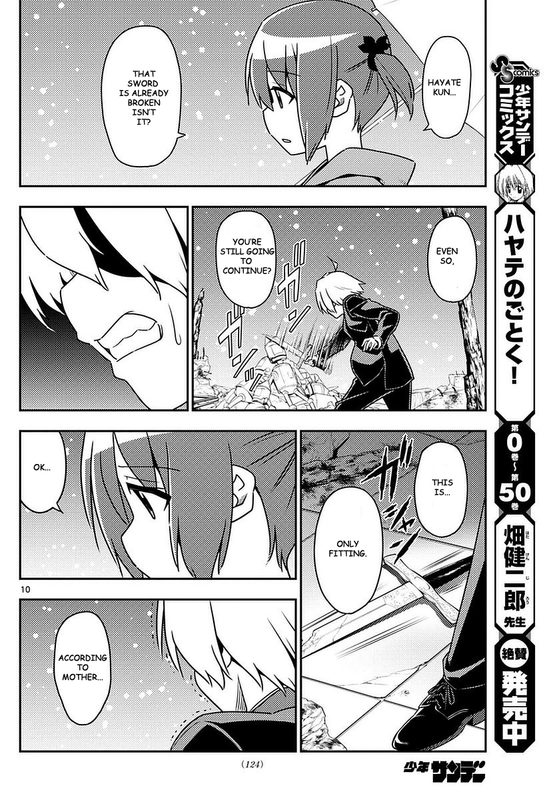 Remember that this scenario is just some kind of what-if dream world inside of Hayate's consciousness. It would be nice if there comes an anime-only continuation of the manga, I suppose. With that said, I think I'll be satisfied with the ending we're getting and I'd be scared to have it ruined by continuing the story any further. 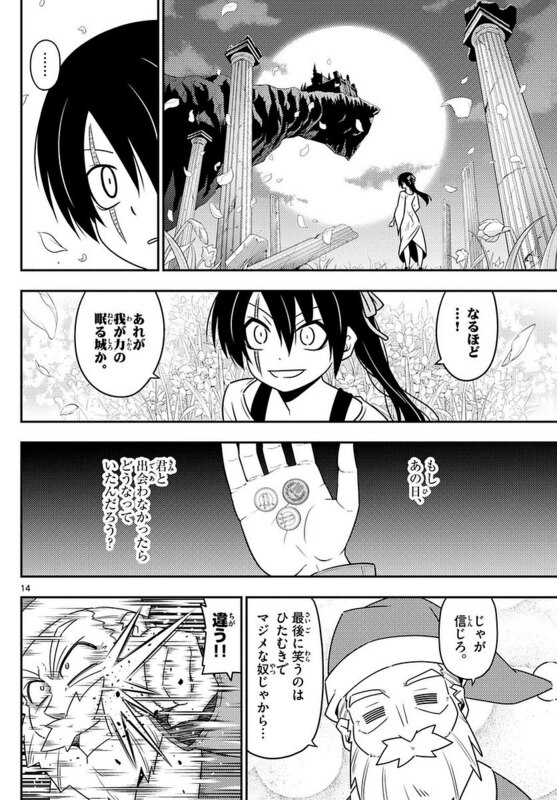 But it would be good if the extended story remains like the extra chapters of Nura the yokai clan. 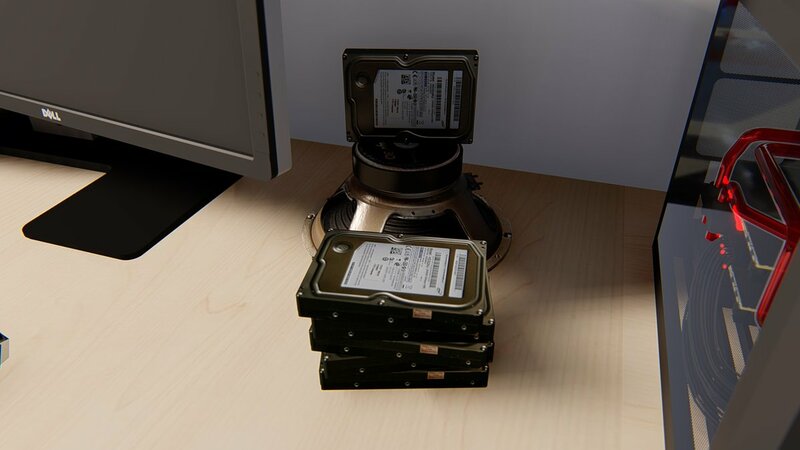 Some of those were funny and some hinted about the future. The huge fanbase can be satisfied too if they see their favourite characters are with some indivisuals more suitable to them. This chapter is almost like the poem, "The Road not Taken" by Robert Frost. There is a part of our minds always considering the "what if" possibility since our decisions and circumstances didn't let us choose the other path. 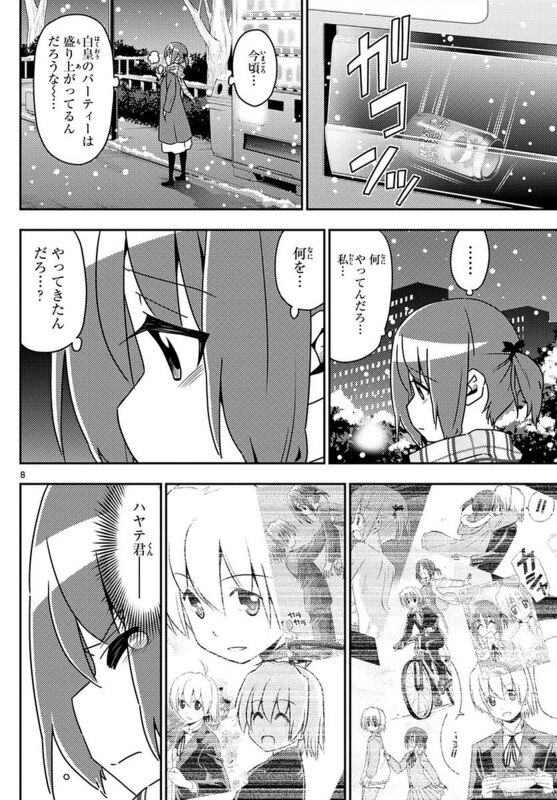 Ayumu visualising another possibility of the past with hayate is a nice view into what might have happened if there was a deviation from destiny. Haha yeah~... also, really not a cause for worry for our ship at this point. It's an excellent way to send off Ayumu -- although I'm quite excited at where this scenario ends up. It can't end cleanly either way. Either Hayate or Ayumu or both of them realize that this is a future that was never meant to be. 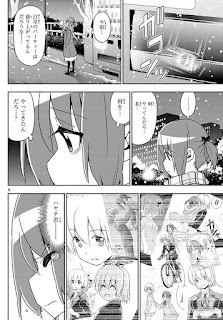 Here's another possible scenario for next week: As Ayumu and Hayate are running away, they cross paths with Nagi and Himegami. Nagi is right in the path of the oncoming Yakuza. At that moment, Hayate instinctively dives in front of her to save her -- snapping both himself and Ayumu out of the "what if" scenario and causing Ayumu to make her final conclusion -- and perhaps being the one to give Hayate the final push he needs to get out of this dream world and do what he really needs to do for Nagi. 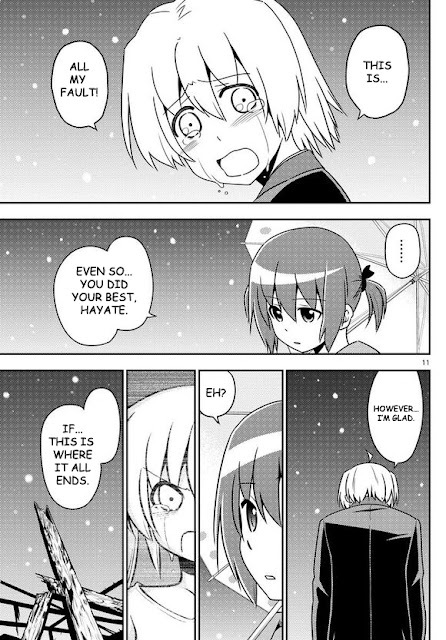 Like, seriously... we're just going to handwave everything else that Nagi has done to show that she deserves Hayate. 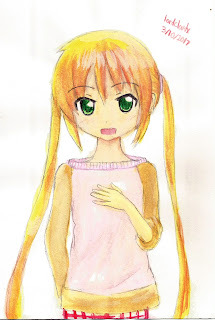 Hayate's lack of sexual interest in Nagi is SUCH A HUGE DEAL BREAKER, that it shows that she deserves Hayate the least. WOW SUCH AMAZING LOGIC HERE, FOLKS! It's all so one-sided because we're just going to handwave everything that Hayate has done for Nagi as nothing but gratefulness unlike with the other girls because he's shown that he at least wants to bone them at some point. THEREFORE, wanting to screw them while doing something for them counts as "ROMANTIC PILLARS OF DEVELOPMENT!" amirite? Actually, I kinda likr your negativity. 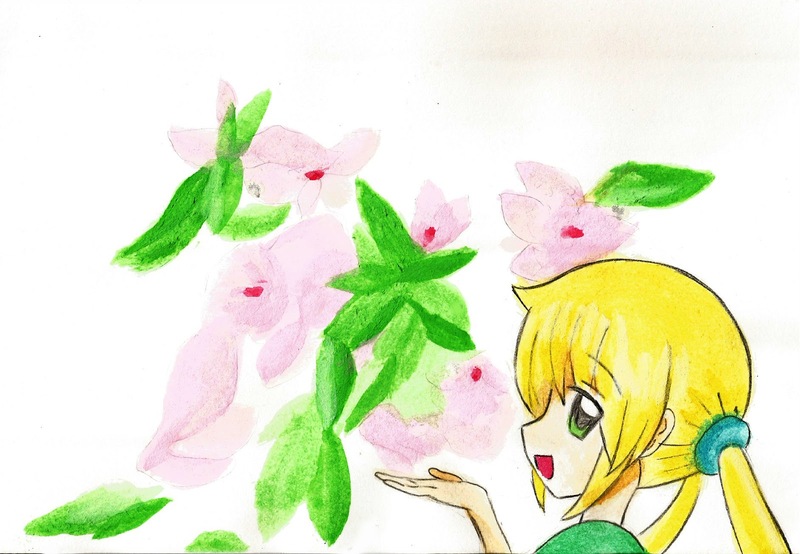 Nagi x Hayate one true ship! Good to know~ I just get irritated when everyone thinks it's open season to attack the HayaNagi ship just because we're winning when most of us haven't even been minding the other ships. 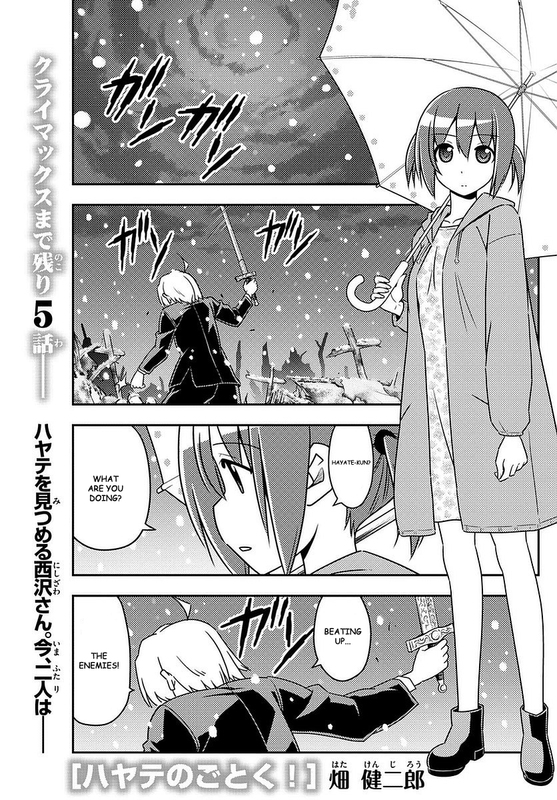 Well, part of chapter 565 is now in Nagi's dream world -- and for some reason, Hayate is in it, the real one. 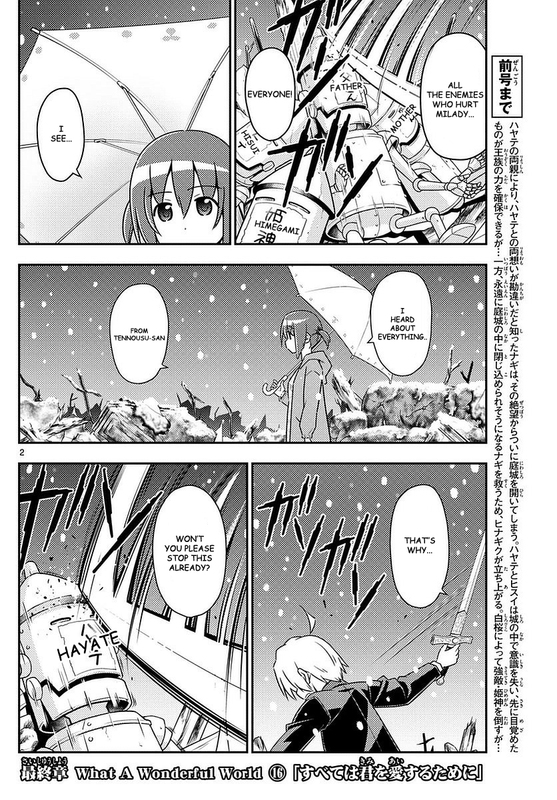 Also, feel sorry for Hayate, he obviously cares so much for her. So,umm.. about the title, whose love is referred to here? 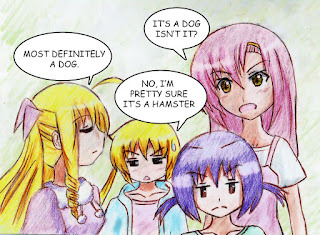 Only ayumu's or it is foreshadowing hayate's feelings too!! Not sure. I mean, it could refer to Ayumu, but we could interpret that as Hayate's feelings too -- given how agitated he was over punishing the enemies who hurt Nagi in this chapter.